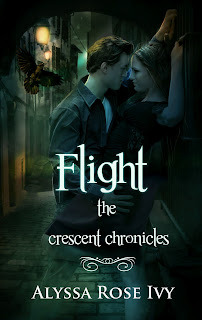 Flight is the first book in The Crescent Chronicles by Alyssa Rose Ivy. From the moment I saw Flight and read an excerpt, I was anxious to get a hold of it but unfortunately it didn’t fully live up to my high expectations. The main protagonist Allie has her life planned out, she would attend Princeton, study business and follow in her fathers footsteps but it wasn’t what her heart wanted; it was something she was doing for her parents, when an opportunity arose for her to work in New Orleans at her fathers hotel she looked at it as a great opportunity to avoid her ex-boyfriend and spend some time with her best friend, Jess – it would be her adventure. Allie was a hard person to like, she was temperamental, abrupt and not the most endearing character but she managed to catch the attention of gorgeous Levi Laurent, a persistent, powerful shifter Pteron - which are hybrid human/crows and he had developed an instant attraction to her. With Jess leaving after an incident, rather than spending time alone Allie agrees to spend her time with Levi and his friends. Levi was a mystery, he diverted many of Allie’s questions, was sarcastic, overly protective and deceived her in a terrible way, he was extremely powerful amongst the Pteron’s but wasn’t forthcoming with information but despite this he easily welcomed Allie into his world after not knowing her at all. I enjoyed their interaction when the sarcasm was avoided but these times were few and far between and Allie really made him work for her affections. The premise of Pteron Shifters was original but the big reveal was anti-climatic and their purpose and being not fully understood. I really expected more but the way he showed her what he was I felt was a bit thoughtless, there was no build-up. My favorite character in the book was actually Hailey, also a Pteron who befriended Allie and revealed more about their secret society than Levi did, I trusted her as Allie did – she was likeable and believable. I was also quite intrigued by Jared, another member of Levi’s group. I loved the New Orleans setting; you really get a great feel for the amazing surroundings – Ms. Ivy’s vivid imagery was wonderful. I am curious to learn more about why the Pteron’s presence is required to save the city. Unfortunately, I wasn’t blown away by Flight but I did enjoy it; it was a quick read and the writing flowed well and the concept was certainly intriguing and unique but I just wanted more world-building instead of a focus on the romance – I was also surprised by the abrupt finish. Despite my issues, I will be picking up the next installment; Levi towards the end of this book did something quite unforgivable so I am curious to see how it all plays out – I think Allie’s attitude throughout the book would have been more apt after this episode. I started reading this, and couldn't get into it..i will try again, love the cover.